Seeing concept phone designs are a common sight for us when it comes to how a device would look from Nokia and BlackBerry. 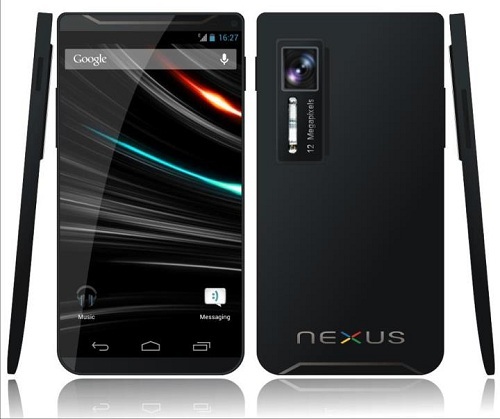 But how about a design of how the next Galaxy Nexus smartphone (probably Nexus 2) might look on arrival? Well what you see above is the concept rendered by Killu-Chan which gives us a moment to wonder, how about this as the next Galaxy Nexus? Going with the design, this concept looks awesome and we would definitely love to have this as the next Galaxy Nexus. The designer didn’t mention if this has been designed by Samsung’s aspect or not, but we would consider it is. The designer has included an included a bezel-less screen which we feel has a long time before it arrives in reality but the screen is a 5 inch display with a 720p resolution and protected in Gorilla Glass 2. And now going by the inside of this concept, the designer has packed-in 32 GB of internal storage, HSPA+ 42 Mbps connectivity, Wi-Fi, Bluetooth 4.0, microUSB 2.0 with MHL and USB on the go. It is powered by quad core Tegra 3 processor clocking at 2 GHz and ‘8 GB’ of RAM. Now we are expecting this to be a clear typo as 8 GB of RAM is not quite possible in the very near future. There is a 12 MP auto focus shooter at the rear with LED Flash capable of HD video and image recording, touch focus, image stabilization and face and smile detection. Also a 2 MP front facing camera has been included with the capability of 720p capture at 30 fps. Android 4.1.1 Jelly Bean is the OS that runs on the concept device and it is arriving with a huge 3200 mAh battery to keep the device running. Did you like this concept device with the design and the included specs? We surely did.